You can’t smoke a cigar without cutting it, which makes it one of the fundamental parts of the experience. However, it’s not an easy task to accomplish even for the most experienced cigar enthusiasts. Cutting your cigars incorrectly can lead to an unpleasant experience consisting of unraveling wrappers and splitting cigars. Meanwhile, using the incorrect tools can end up damaging your cigar, rendering it almost impossible to smoke. Whether you’re a veteran or newbie cigar smoker, our guides on cigar lighting can help you develop the perfect technique for a clean cut every time. You can also discover our own recommendations of our favourite tools to make the best cuts. Discover The Best Cigar Cutters! This very section of our cigar series covers all the specific details that you need to know about cutting cigars. Our comprehensive guides were written to provide you the perfect balance between detail and ease of use. With Bespoke Unit, you can learn not only which cigars cutters are available but how to use them as well as the ones we recommend. After using our guides, you’ll be able to create the cleanest cuts and concentrate on your own enjoyment. Use the menu above to navigate between our various cutting guides! Never let your cigar unravel again! Our easy guides will make the task a breeze so you can enjoy your cigar! Cigar Cutting Guides Reviewed by Charles-Philippe Bowles on January 8th . What Should You Use To Cut A Cigar? There are a number of different ways that you can cut a cigar. Each one has particular characteristics best suited to different types of cigars as well as their own drawbacks. Different cutters will offer various types of cutting styles. Usually, this is indicated in the name of the cut. For instance, a v-cutter will create a v-cut. Meanwhile, any guillotine cutter will make a standard straight cut. Furthermore, a dull blade can harm a cigar and end up ruining your overall experience by crushing or tearing the tobacco. Whatever tool you choose, the blade needs to be sharp to cleanly cut through the leaves. Simply click on one of the possibilities above to jump straight to it below. If you’re still not equipped with a cutter, you can also view our recommendations of the best cigar cutters available. One of the most common and cheapest forms of cigar cutters, single-bladed guillotines are the basic type available. Much like their double-bladed cousins, they perform what is known as a straight cut. Nevertheless, with the increasing use of double blade guillotines, their popularity is waning. Reliable single blade guillotines are hard to find and most are often very cheap for when on a tight budget. A decent guillotine usually features a diagonal blade, which ensures that the cigar is sliced rather than crushed. However, single blade guillotines tend to dull quickly and are hard to maintain. That said, there are ornate version available that can sometimes resemble a folding pocket knife with an exposed blade. Having replaced their single blade brethren, double guillotines are the most popular tools in circulation. Now that they can be sometimes found as cheaply as normal guillotines, it’s rare that an enthusiast doesn’t turn to one for their daily cutting needs. Double blade guillotines can vary in shape and quality as well as the materials used. Basic models feature only two opposing blades in a plastic case that are pressed together to cut the blade. However, premium models can feature high-grade steel and spring-loaded mechanisms whilst others even include self-sharpening blades. Particularly prestigious designs can also be encased in rare wood and expensive materials. Overall, guillotines are suitable for most cigars and gauges. That said, some larger cigars may struggle to fit inside the opening. One drawback of cheaper guillotines is that the blade can’t be removed. This means that the blades can’t be taken out for sharpening and may dull over time. However, they’re versatile and relatively easy to use once you’ve developed the knack for it. Head to our guide to learn how to do a straight cut with a double blade guillotine. One of the oldest tools for cutting cigars, specially-made scissors are often perceived as a premium choice. 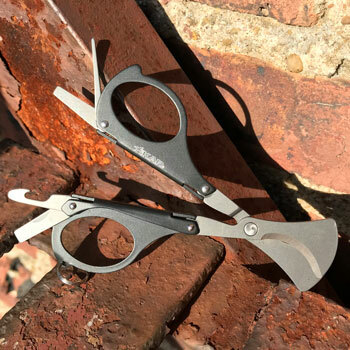 Often made from high-grade steel, cigar scissors cut more efficiently. Unlike guillotines, there’s no hole to guide or rest the cigar. Therefore, they can be harder to master as they require a steady hand. Nevertheless, the cutting action is very similar and performs the same straight cut. The advantage of cigar scissors is the extra precision that it offers in creating the cut right for you. However, as mentioned above, they’re hard to master! Those looking for a luxury cigar cutter would certainly best consider scissors as an option. Although they may take a little practice, they are able to perform some of the finest and most precise straight cuts on a cigar. Learn how by reading our cutting guide! A popular choice for travelling, the cigar punch is a small blade that’s been curved into a ring. This blade is used by pressing it into the cigar’s head to remove a piece of the cap. Punches are often attached to a keychain, which makes them quite convenient. The blade can be concealed either with a spring-loaded “Havana” mechanism or with a screw cap. Some experts may criticise punches as their blade creates only a narrow hole, which causes a tight draw. However, there are multi-punches that offer different sizes depending on the gauge. Nevertheless, the advantage of the punch cutter is in its convenience and ease of use. As they’re often on a keychain, they’re easy to keep handy and simple to use. Although punches can’t be used on pointed figurado cigars, they’re particularly useful when trying to cut a gauge too large for a guillotine. 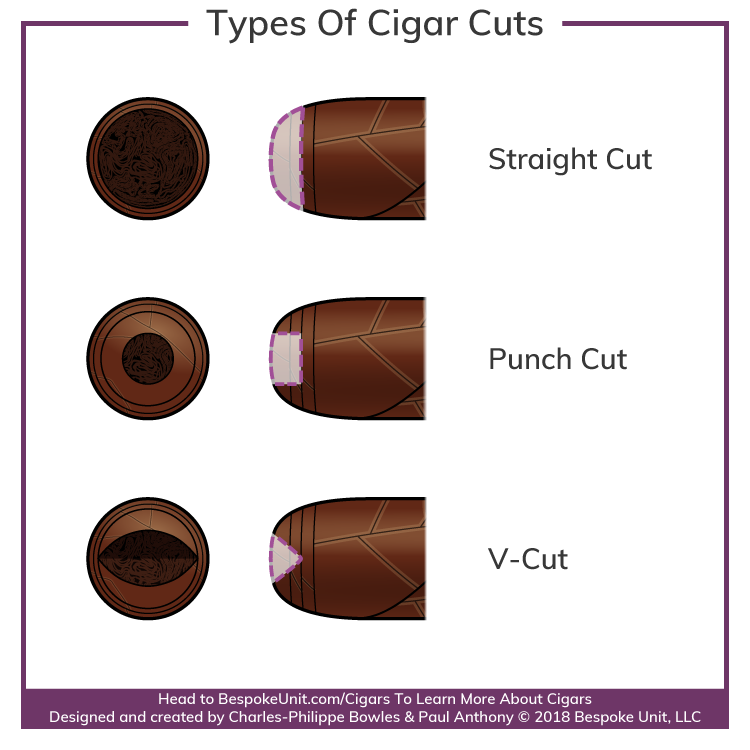 They’re also very easy to use and we’ll show you how in our cigar cutting guide! Unfortunately, V-cuts have faded in popularity in recent years. Nevertheless, there are some enthusiasts who swear by them. They work by featuring a wedge of blade that cuts a v-shaped chunk out of the cigar’s head. Sometimes referred to as the Cat’s Eye cut, v-cuts can vary in shape and sizes. Some appear relatively similar to guillotines with a protruding blade wedge that slides into the hole. Yet, V-cuts are traditionally long handles with an embedded lever that lowers the wedge into a hole at the end. Some vintage v-cuts can be made out of premium materials such as rosewood or ivory. However, a common complaint of V-cuts is that cheap blades dull very quickly, which crushes rather than cuts the head. Another issue with v-cuts is that it can be hard to master the correct depth for cutting. If the incision is too deep, it can result it a draw that’s too soft as well as an uneven burn. That said, V-cuts offer improved circulation when done correctly and keep bitter tars at a distance from the tongue. They’re not the easiest cutters to use if you haven’t yet tried so check out our step-by-step v-cut tutorial to get it right! Although rare, cigar piercers or lances are growing in popularity. Similar to draw pokers that are designed for unblocking plugged cigars, piercers are used to make a pinhole opening. Critics will argue that the draw created is far too tight to create a pleasant and full smoke. Furthermore, it can cause tar and nicotine to build up around the head. This can prevent you from drawing in smoke or leaves an unpleasant flavour. Nevertheless, some people do enjoy the sharp burn on the tongue. Sometimes the piercer is then used to hold the cigar as it burns to the nub to avoid burning the cigar. Want to see each of these cutter types in actions as well as learn their features and drawbacks? Watch the video below to learn more! 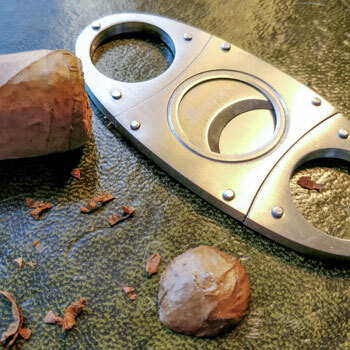 Now that you have read about the various types of cigar cutters that you can use, learn how to properly use them with our easy step-by-step cutting guide. Alternatively, see what we recommend as the current best cutters on the market!